This week, I introduce combination dishes. My plan is to eventually illustrate some really complicated dishes, like casseroles or stews with a million-and-a-half ingredients. … but not today. Let’s start small. Also, I don’t have any complicated dishes to show you this week. 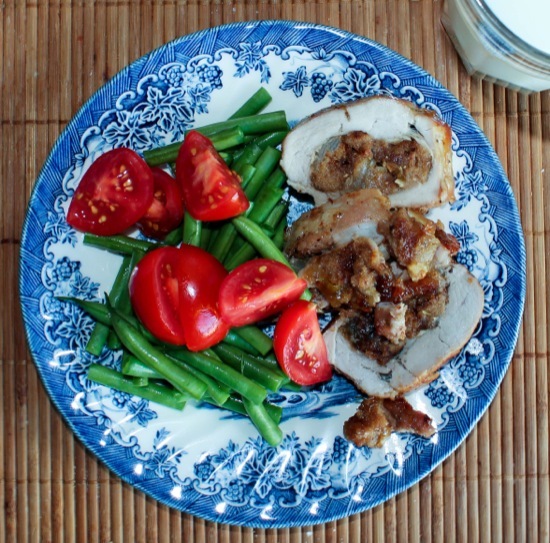 The dish below is Fig-Stuffed Roasted Pork Loin from Ad Hoc at Home by Thomas Keller (a fantastic cookbook!). I made it about a week after we moved to Illinois. Let’s take a closer look at that plate. Looks pretty tasty. 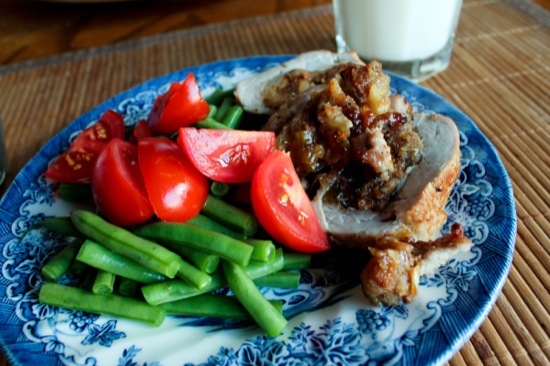 Veggies on one side, mouth watering stuffed pork loin on the other. But, how do we MyPlate this? (And yes, I did just “verb” the word “MyPlate”.) The protein and grain are all smooshed together! Did I hear a “nice job, Happy Jessie!”? … no? The “Veggie & Fruit” half of the plate is pretty well set, so we can push that to side, so to speak. As for the “Protein” and “Grain/Starch” quarters … you have to use a little imagination. The fig-stuffed roasted pork loin is pretty much how it sounds: a pork loin stuffed with fig and roasted for a half-hour or so. The actual recipe consists of sauteing shallots, then frying bread cubes in the flavored oil to make a kind of stuffing. Fig jam is mixed into the stuffing (and let me tell you, the combo of fig, pork, and shallots is exquisite). The original recipe calls for just a few bread cubes for an entire pork loin. I wanted to boost the amount of grain in this recipe, so I increased the bread until the amount was about equal to the pork (besides, this stuffing is just so darn good, who could resist having more?). I used whole wheat bread instead of white bread for a fiber- and nutrient-rich swap. So! In the final product, the amounts of “Protein” and “Grain/Starch” are about equal. I divided the Protein and Grain/Starch “half” of the plate into their respective quarters to make it easier to visualize. One final thing: If I were eating this meal again (and I’m sure I will), I would add more food to this plate. The plates I use are only about 8- or 9-inches, so I should be filling those things to the edge. It’s possible I wasn’t very hungry that day, or I had my eye on a particularly heavy dessert. Still, the plate above is not enough food for me in a typical meal. Have a great weekend, everyone! See you Sunday! 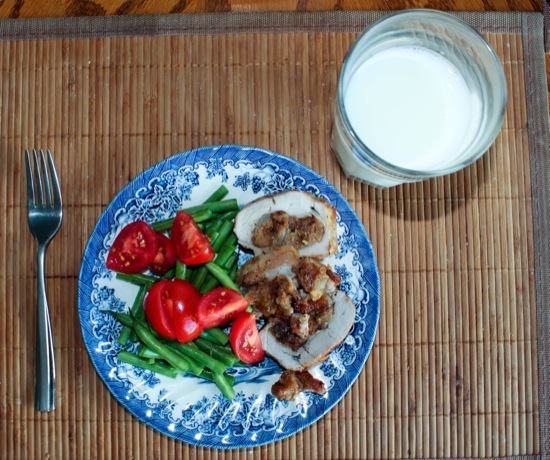 Q: What should I MyPlate next? This sounds so fancy, it must be super delicious! I wanted to ask you about the serving size of semi-hard cheeses. Now that I have access to cheap yet amazingly good cheese at Trader Joe’s, I’ve been eating more of it than ever before. Serving sizes are usually stated in terms of weight, which doesn’t really help. Do you have any recommendations? I love how you do these visual plate presentations – when you can actually see it like that it’s easy to apply to real life. Hi Lucy! That’s a great question! Many foods, like cheese, list servings sizes in weight, which is not all that helpful unless you have a food scale on your counter (or in your bag when you go out to eat :P). A common serving size for hard and semi-hard cheeses is one ounce. A handy way to estimate an ounce of cheese is to use your thumb – your thumb equals about one ounce of cheese. Another one that’s easy to visualize is dice – two dice equals about one ounce of cheese. I use this one all the time because I eat a lot of cheese! Yum! This looks so very good. I love stuffed meats, and I never thought how they could be a combination of both grain and protein. Brilliant! Thank you for sharing. These are some of my favorite posts to read right now. I hope you have a wonderful weekend! I love it! Great visualization of this. I have a hard time with those combination dishes too. It’s not so easy to teach that, especially when you don’t have too much time with the client. Good work!